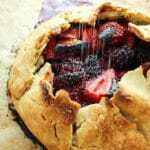 This berry galette is a fuss-free, summer dessert that uses wholesome, fresh ingredients. In a medium bowl, combine berries, sugar, and lemon zest. Stir to combine. Set aside for later. Melt coconut oil and allow it to return to room temperature. It should still be liquid, but not warm. Prepare your water in a bowl with ice cubes. It needs to be ICE COLD. In a large bowl, combine flour, sugar, and salt and stir. Place the bowl of dry ingredients into the freezer to chill for 15 minutes. Slowly add the coconut oil to the dry ingredients while mixing with your hands. Do your best to combine it evenly – it will not feel like dough yet. Return the bowl to the freezer for 15 minutes. Remove the bowl and use your fingers to break up any larger chunks that remain. Don’t spend too long doing this – the coconut oil will melt and need to be chilled again. Start pouring in the ice water while mixing with your hands. Add it 2 tablespoons at a time until the dough is workable. Mold it into a large disc, about 1 inch thick. Wrap it tightly in plastic and set aside to rest at room temperature for 30 minutes. Prepare a baking sheet with parchment and place the dough disc in the center. Use your hands to work the dough into a larger circle. You may need to flour your hands to prevent sticking. Scoop the berries into the middle of the dough. Then carefully fold the dough around the berries. If the dough begins to stick, use a floured spatula to lift it. Some tearing may occur, but that’s ok! Galettes don’t need to be perfect. After the edges are folded up, transfer the baking sheet to the oven and bake for 40 minutes, until the crust is golden brown. Allow it to cool and then serve. I think a scoop of vanilla ice cream would be a welcome addition! *I highly recommend using Wholesome Chow’s GF all purpose flour blend. I find that their mixture works better than most for baked goods. **This crust is barely sweet – more like shortbread. If you prefer a sweeter crust, add another tablespoon of sugar.